* The recommended price is indicative and would vary based on the condition of the car. Here is why so many choose to sell cars through CarAndBike.com! 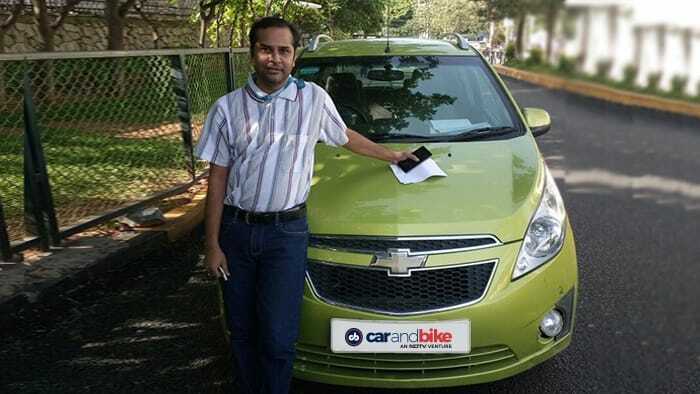 The overall experience with NDTV CarandBike was good & fair. The transaction was transparent. The best part of CarandBike is that they directly deal with the customers without the interference of dealers. I found the buyer near by home through CarandBike.com. Because of CarandBike, I was able to get the best price for my car. It’s was a pleasant experience selling my car on CarandBike.com. ​I was able to sell my car within 4 days and was very happy with the offer that I received. Thanks to CarandBike team. 2.How to sell your car online ? You can sell your car free in 3 simple steps. Provide your contact information, car details and set price and you are done. We will list your ad post verification. Ads with photos attract more buyers and please ensure to get clear pictures of both the interior and exterior of your car. The pricing of your car is very important and we help you with the same through our Valuation Engine based on demand-supply trend and recent nearby sales of all cars in http://carandbike.com. Also please make sure that you are reachable in the mobile number that you had provided. 3.Will I be charged to get my car listed / inspected ? No. It is absolutely free ! No. Inspection and certification is carried out on a selected few cars based on car’s location and other car parameters. Inspection is at sole discretion of the seller and it will be done post your confirmation at free of cost. Our car inspectors will visit your location at your preferred time to carry out inspection which would approximately take 45 minutes. Test drive is mandatory for complete assessment of vehicle condition and for attracting more prospective buyers and please make sure to keep a copy of Registration Certification (RC), Insurance and Service Records in handy. 5.How can I get the best price for my car? Putting your car up for sale online has become extremely easy and CarAndBike.com has simplified the selling process further. Want to Sell Car Online or Sell Old Cars, all you need to do is leave your personal and car information so that we can assist you to sell second hand car online at the best possible price. You can also manage your 2nd hand cars from your profile page. Right from listing old car online and ensuring all the information about your Used Cars is complete, the CarAndBike.com team works relentlessly to put your mind at ease. We minimize your time to Sell your Car online and maximize your chances of getting the best deal on your used car from thousands of prospective buyers. Next time when you think “Where to Sell a used car”, carandbike.com is the right place. So sit back and sell your car without indulging in the painstaking process as our team strives to bring you the best deal. questions. We are here to help you out.